12/15/99 Slashdot.com Postings Are Links Illegal? 12/13/99 About.com The End of Linking? 12/10/99 Photos of the media asking questions outside the federal court building. 12/06/99 Mormon Central - H. Michael Marquardt's new website. 11/30/99 All specials have been extended to the end of 1999! 10/13/99 In response to receiving the following letter, we have removed the excerpts from the Church Handbook of Instructions, 1999, from this site. 10/07/99 #78 Messenger, Dunn in the Name of God! 9/23/99 Mormonism�Shadow or Reality? - Hardbacks are now available. 9/20/99 What is the Journal of Discourses? Tomorrow is the last day for our free book offers. Also, we have completed the move to a new server. If you have had problems accessing our site recently, hopefully that is at an end. We are still at the same address [www.utlm.org]. No need to change your bookmarks. And finally, another large project is nearing completion. Can't say much other than it will be added to our Online Books section. 8/31/99 New Titles Added - section for listing new titles. 8/03/99 Where Did Joseph Smith Get His Ideas for the Book of Mormon? 6/28/99 Is Polygamy Part of God's Plan for Marriage? 6/17/99 Note on things that came. Our Shopping Cart is now Online! Order titles from us in the safe, secure manner from the privacy of your own computer. This fully functional Shopping Cart uses SSL encryption to safeguard your transaction. If you are unfamiliar with Shopping Cart systems, be sure to read our Shopping Cart FAQ for more information on how to place an order. 5/11/99 #95 Messenger, Was Joseph Smith a Magician? 4/08/99 Note on things to come. Just a quick note to explain the lack of updates. We are currently working on integrating an Online Shopping Cart System into our website! Soon you will be able to place a secure order with your Visa, MasterCard, Discover, or American Express card from the privacy of your own computer. Our shopping cart system will also allow for the creation of a form with your order filled in and ready to be printed then faxed or mailed to us. Now for the down side... Our limited staff is working hard, but it will require a few more weeks before the online shopping cart is ready for use. 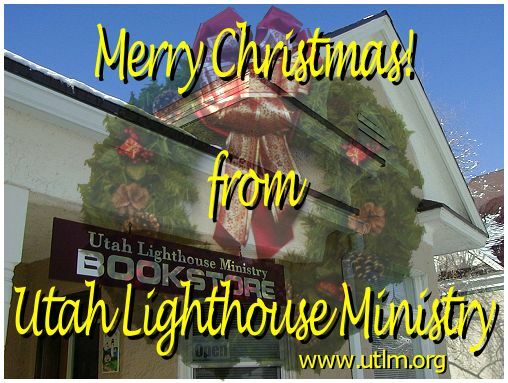 Until then, you can still print out this form and fax (801) 485-0312 or mail (Utah Lighthouse Ministry P.O. Box 1884, Salt Lake City, UT 84110) your order to us. Or simply call (801) 485-0312 and we'll be glad to take your order by phone. 3/30/99 Was the Garden of Eden in Missouri? 3/30/99 Where is Cumorah? - photo of Hill of Cumorah added. 3/25/99 How Do We Test A Prophet? 1/28/99 General Information FAQ - basic questions & answers about Mormonism. 1/15/99 Anthon Transcript - photos of the Anthon Transcript and more. 1/08/99 Joseph Smith's Handwritten First Vision - Contains photos of his handwriting and a transcription. 1/07/99 Evolution of the First Vision and Teaching on God in Early Mormonism by Sandra Tanner.